If you’re interested in having mathematical laws work in your favor—and you are—you’re going to have to brush up your Internet skills a bit beyond sending emails and logging onto your Facebook and Twitter accounts. You should at least know how to create and maintain a blog. This is fun and easy, once you surmount a not-too-steep learning curve. I cannot overemphasize the importance of Internet for artists. A dozen years ago, when my husband proposed to make me my first website, I said, “What do I want a website for? I’m an artist.” Today he’s at work on his seventh (Or eighth? I’ve lost count.) printmaking website, some of which are exclusively mine, others in which I participate with other printmakers and studios. Today 90% of my living comes either directly or indirectly via the Web of Webs. You might wonder how that YouTube interview came about. It wasn’t complicated. My husband, Mike, wrote a list of questions, then asked me them off camera in my studio. Fair enough, the cameraman was a friend who is a professional, but your daughter or nephew can also run a camera and ask you some questions. Just make sure they use a tripod and a microphone on a wire. The sound is just as important as the image. Give them motives to maintain more frequent contact both with you and among themselves. The usual way to do this is through a shared-interest group. In your case the interest is printmaking—or sculpture or video art–but it could easily be 19th-century egyptology or lace making. There are wonderful free—or almost free—applications on Internet for achieving this. Our favorite is Ning.com. Here’s a link to our site there: http://printuniverse.ning.com. The most obvious one is to give lessons/courses/workshops. One of the most rewarding things to do is to give classes to children. A poet friend of mine teaches children with special needs—sometimes it’s six-year-old geniuses, others mentally handicapped children. About once I year we arrange for me to go over to Teresa’s school and do a class with her kids. Talk about creativity and idea gathering. I learn as much as they do! I’ve done workshops informally off and on for years, but I didn’t realize what a life saver it could be until last year, well into the current economic downturn which has been a bonanza for bankers and speculators, an inconvenience for civil servants and a catastrophe for workers, including working artists. At the end of 2009 Mike and I decided to bet all of our modest nest egg on the construction at the end of our garden of an apartment where artists could stay when they came here to work. As it was located where our hen house used to be, we called it “El Gallinero,” “The Chicken House.” Mike, of course, made a website for it: http://artistsrefugespain.wordpress.com. For reasons which are still not entirely clear to me, the Gallinero took off. 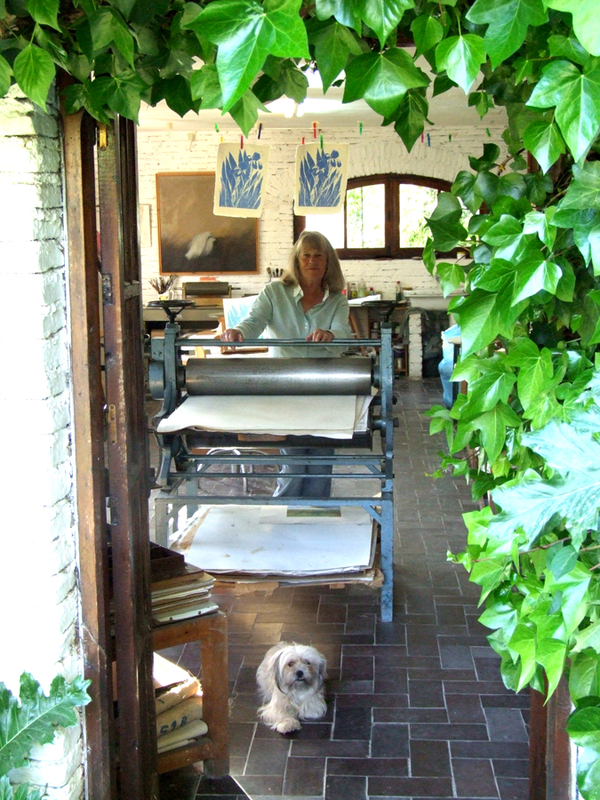 Suddenly I started receiving bookings for workshops and collaborative work from printmakers and other artists, many of them professionals, from all over the world. Since the spring of 2010 I have hosted artists from Spain, England, Scotland, Hungary, Australia, the U.S.A, Canada, Italy, Mexico, and Russia, a couple of them more than once. And I sadly had to turn away an Italian woman novelist who wanted to stay in the Gallinero for five months to finish her fourth novel. The latest is an email from a commercial artist in Namibia (Namibia! I’ll give you a hint: it’s on the west coast of Africa between Angola on the north and South Africa on the south.) who needs a thorough grounding in printmaking techniques and wants to come for a long stay. To provide artists with a place to tell their experiences with galleries. To offer them a forum for contributing and commenting on alternate ideas for marketing art, ideas for bypassing the galleries. Though it never took off, it’s still online and you can consult it, and even tell your own art-gallery stories or offer alternate marketing suggestions, if you like. My favorite non-gallery sales technique is to mount an open-studio weekend once or twice a year. I hang the work around the house, studio and Gallinero, invite out friends and clients and put out some wine and tapas. This is a line I read some years ago, and it has stuck with me. I can’t even remember the context, but the affirmation is almost true. So if there are things you need to learn in order to advance your career as a working artist, get started now. You may be surprised at what you’re capable of. I’d like to know how you get on. Keep me posted: maureen@maureenbooth.com.